If you have ever tried to follow the Opscode Getting Started Guide for Chef, you'll quickly be overtaken by Chef jargon, confusing instructions, many assumptions, and no clear direction. Even the most experienced developers had a difficult time following the Opscode Wiki. While it serves as a great reference resource, you pretty much have to know Chef before it is of any use. In Part 1 of this 2-part series, we will walk through setting up the Chef environment on your local machine. In Part 2, we will demonstrate how to provision your personal laptop using Chef. One of the best things about Chef is that it is idempotent. Unlike a simple bash script or complex startup script, Chef can be applied to the same machine hundreds of times. Only the "changes" will be executed on each of the clients. This makes deploying and updating thousands of machines as easy as baking a cake! One of the most interesting and confusing parts about Chef is its lingo. Everything relates to food. Be sure to grab a snack before diving in any further. One of the most dangerous practices when using Chef is applying prior knowledge. In Chef, everything is named relative to Chef. This means, even though your are provisioning a production server, it's still a Chef client. This can be very confusing at first, but once you start thinking in terms of Chef things will begin to make sense. This is the most simplistic picture. It's possible for a single machine to exist in all three of these roles simultaneously! There are subsets of Chef, such as Chef-Solo, but those will not be discussed here. A typical scenario begins at the workstation. A developer creates a cookbook, role, or other artifact on the local machine. When finished, that artifact is uploaded to the Chef Server. The Chef Clients receive these (new) instructions and execute them locally. Before continuing, please make sure you understand that these are very over-simplified definitions and abstractions. Chef is much more powerful that these simplistic definitions allow. You probably only have one organization, but the image should give you a good idea. First thing you'll want to do is Regenerate validation key and Generate knife config. We will talk about this more in detail, but save these files in a handy place for later. These files should always be kept securely. Also, if you didn't get your private key when registering, you should do that now (for some reason, Opscode does not always stream the key). Go to the Opscode Community Site and login (if you aren't already). Click on your profile and then choose get private key. You should also install git. Check out the Github tutorial for installing git. This command will install the Chef gem as well as some other dependencies. 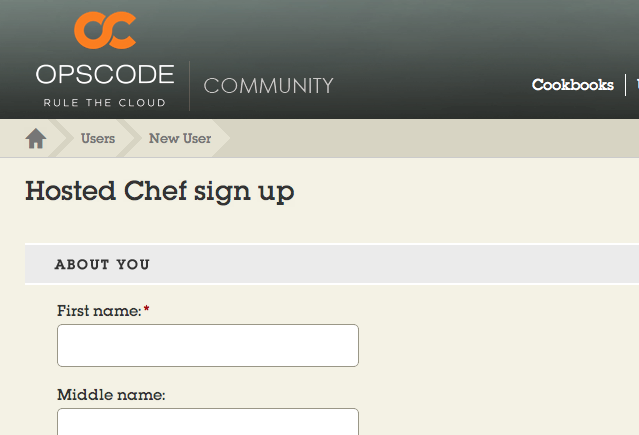 A this point, you should have a novice understand of Chef and Chef Jargon, have an account on Opscode Hosted Chef, and have a working version of Ruby, Git, and the Chef gem installed. The rest of this guide will assume you have completed all those steps correctly. Take a few minutes to poke around the repository. 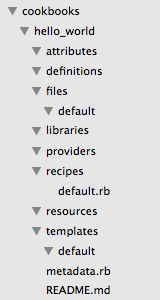 You definitely won't understand everything, but look at a few READMEs (in subdirectories). If this command succeeds without error, everything is set up correctly! This concludes setting up your workstation. Now we are ready to create our first cookbook. Wash your hands, put on your Chef's Hat, and get ready to bake! We are going to create your very first cookbook. The cookbook will be very simple and is more for demonstrating working with knife and chef-client. This cookbook will create a file ~/hello_world.txt that says "Hello World!". You can see we are referencing a node variable. This refers to the current client that Chef is running on. The template keyword is a resource like we defined before. It tells the recipe to render the given template source to the given file. We also specify the file permissions using mode. it means that your key is invalid. Regenerate your personal and/or organization keys and ensure everything is placed in the correct directories. 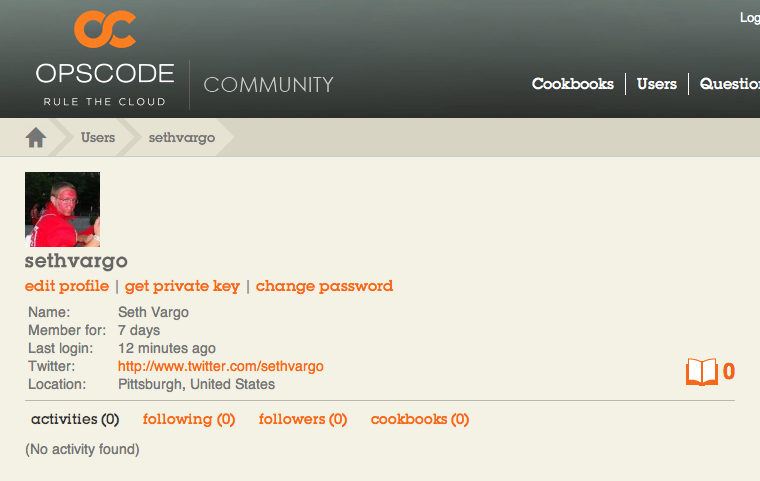 Our cookbook is now on Hosted Chef and ready to be distributed to our nodes. Chef doesn't automatically tell nodes to update. You can do this with a cron job, running chef-client as a service, or by running chef-client manually on any node. WARN: Node NODE has an empty run list. It doesn't appear the file was created. We must have done something wrong! Actually, we did everything correctly. We just forgot one step - we never told our node to execute the recipe we just wrote. By default, Chef does not execute any of your recipes. You must explicitly require them. There are a variety of ways to do this. We will use a run_list here. INFO: Storing updated cookbooks/hello_world/recipes/default.rb in the cache. Open up your $HOME directory and you should see a file named hello-world.txt. Look inside and you'll see the those node variables were translated into plain text. Awesome! You can delete that file or leave it around as a reminder of how awesome Chef is. We have one last thing to do before we are done with this tutorial. Well, this concludes this (rather lengthy) tutorial on installing Chef, registering for Hosted Chef, creating your first cookbook, and provisioning your first machine. Part 2 of this series will cover more recipes and full provisioning and customization of your personal laptop using Chef.